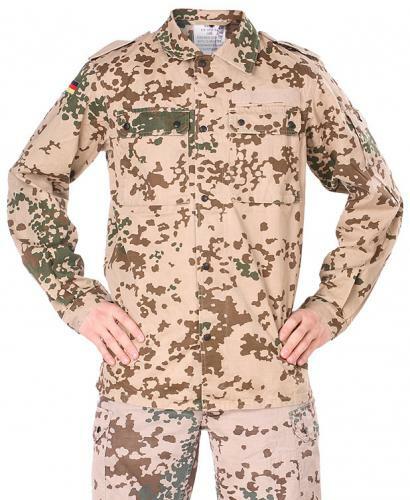 Bundeswehr issue desert shirts. A lightweight, comfy shirt for hot weather, total about one month here in Finland. This simple summer service shirt features a snap fastener closure, velcro adjustment tabs in the cuffs, two breast pockets and a sleeve pocket, all disguised in the Tropentarn desert camo. The German flags on the sleeves can be carefully removed if necessary. Sizes are given in the Bundeswehr system; total height of the user / chest circumference. See Bundeswehr size chart. Used, but in serviceable condition. If there are any holes, they are well repaired. Amazing shirt looks much better in person than in the photos. Ainakin omassa puserossani erona flecktarn-versioon puuttuvan vetoketjun lisäksi on myös kainaloissa olevat verkolla varustetut isohkot tuuletusaukot ja ehkä siitä johtuen vähän rennomman oloinen leikkaus. Tropentarn on lisäksi nätimpikin. Velcroakaan, tuota saatanan työkalua maan päällä, ei ole onneksi niin paljon, että se harmittaisi puolta tähteä enempää. En tosin tiedä miksi kokolapusta oli sutattu nro 13 yli ja piirretty tussilla 7 tilalle - joku varusvaraston veijari eri mieltä koosta? Aion kyllä ostaa toisenkin. As supergut as the tropentarn trousers, good cut, perfect fit. This is an amazing shirt. I bought two of them and indeed, they're as comfortable as possible. Personally I prefer these well over the British field shirts. These seem slightly more robust and, well there's something about German quality that very much pleases me. Mine came as new, unworn shirts though that made little difference to me. An outstanding shirt for the price; the cut is great and just like the trousers, the fabric is light and comfortable while still being tough enough for harder use. A really nice field shirt. This version features mesh vents under the armpits. It also lacks a zipper -- the shirt is kept closed by buttons only. The one I received shows only minor signs of wear. As others have said, this shirt looks better in person than in the photos. This shirt is true to size and looks great. 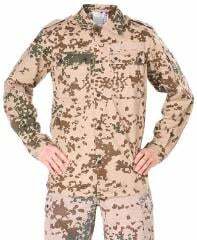 It is more of a light jacket than a shirt, and is only slightly thicker than the Flecktarn version, but does have the under arm vents for cooling as mentioned. Mine has a shield-shape velcro patch on one arm, so be prepared and get some morale patches when you’re ordering if you’re bothered by uncovered Velcro like I am. The Varusteleka support squad patch looks like it would be a good fit. Oh well, I’ll order it next time. If you’re trying to choose between this and the British desert DPM version like I was, the British version is much lighter and could be worn on very hot days. This might be more for spring and cool evenings. Outstanding! Great fit,great build quality, appears brand new. Very comfortable. Im 183 cm,95 kl and ordered the 180/190 110 perfect.